We are a local Croatian family who are dedicated to make everyone have a wonderful experience staying with us. 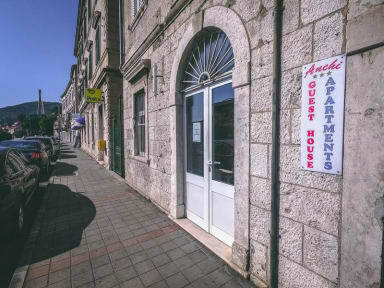 If you want to feel at home in Dubrovnik, then come visit us and meet the best family around town. between the Main port and the Main Bus Station (300 m) in a calm residential area called GRUŽ. It is also close to several supermarkets, bakeries, shops, restaurants, ATM, banks, laundry service, pharmacy, post office etc..
You will be at a 30 minutes (2,5 km) walking distance to Old Town or 5 minutes by public bus 5 minutes (15 kunas). You also have plenty of beaches that are reachable with public bus in less than 15 minutes! And the bus stop drop you at 100 meters from our Guesthouse. We have different types of dorm (four with 8 bed mixed dorms & two 4 bed mixed dorm) with comfortable beds and air conditioning. You also have access to multiple bathrooms, a big common area, laundry service, TV, reception, two fully equipped kitchens, nice terrace overlooking a large beautiful garden with BBQ and lots of deck chairs. Of course, we give you full access to multiple FREE services and stuff. City tax is not included - 7.00 HRK per person per night (approx. 1.00 EUR). Also we can help you book many types of excursions with special discounts for our guests. and much more .... if you need more detail : JUST ASK US IT’S GOING TO BE A PLEASURE TO HELP YOU ! Don't miss out this summer and book your bed as soon as possible. Hope to see you soon ! It was an amazing experience. It is very near to the bus station, so if you arrive late at night, you can just walk there. It was 40min walk from the old town, which was okay for me. But if you want , you can even take a bus or taxi. You feel at home when you are at this guesthouse. The aunty is really sweet, she would always smile and she helped me with any queries I had. She baked aloot of christmas cookies for us and they were all soo tasty. I would definitely stay here again. I love this place so much...I was sad to leave. I could live there, and I felt like I was at home!!! I really loved this place! It is a bit far from the old town but that is not a bad thing. It is close to the bus station, port, supermarket, and nice places to eat and drink. It was great to get away from the hustle of the old town and enjoy the quiet while recovering. Anna is also the best host you could ever have and really made my stay in Dubrovnik. Location great for the bus! Very few guests when I visited (march) so it was quiet. Big kitchen and nice bathrooms. I spent a very good moment at that hostel, it was very cleand and the landlord it was very kind and nice. The hostel it was good, a little bit away from the old town (30 minutes walking) but it does not matter because if you are traveling you know that you need to walk. It's very close to bus station and one supermarket, that's perfect. I stayed in the hostel for a week and it was great. The location is really good and it is about 3km to Old Town. The bathrooms could use some fixing, but otherwise the place was fine. Best part of the hostel is absolutely the "staff", Anchi and her family. When talking to her, you feel that she has the spirit of a traveller and she really loves hosting people to her hometown. As one of the other guests said, staying at Anchis guesthouse is like staying at like your aunts home. Super friendly owners, very chatty and always making sure their guests are ok. They let me stay an extra day as my bus wasn't till late and provided me with extra food too! Good location, can walk to the old town and opposite the bus station so very convenient. Safety was a bit of an issue to begin with as there wasn't any lockers provided upfront however i found some in the more modern kitchen that had keys in and they protected my stuff well throughout my stay. 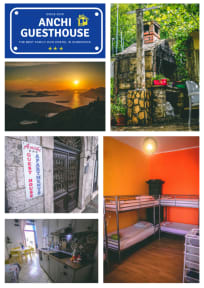 Would recommend this hostel! This hostel feels like home! The owner was lovely, making cakes for the guests and very welcoming. Not huge hostel atmosphere given it’s a guesthouse but this was fine as there is still a spacious common room to meet others! Easy walk to old town and could not be better suited if arriving/leaving by bus!